I have been accumulating these shipping containers from Tablescape in dribs and drabs, steadily gathering more and more. I have at last count around 18, which should do for a credible container yard or docks set-up I hope (click on pictures to enlarge). The latest batch are the rust red colour (top picture) and were painted that colour on request (the usual packs come in 3's with one of each colour of grey, blue and green). Tablescape are happy to listen to customer requests on having their stuff in different colours and cost depends on whether they have that colour in stock or not. Since they had a suitable colour, there was no extra cost for the 6 I bought. The purple containers (a set of 3) were re-painted by myself. It did take a few coats to over-paint the original colour, so I will look to discuss custom colours with Tablescape if I want more in non-standard colours. 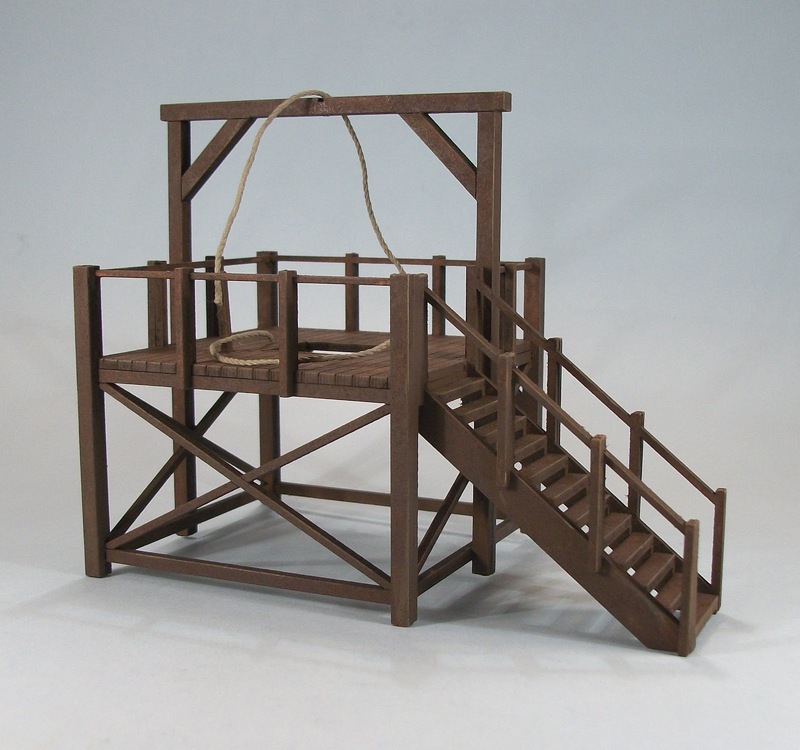 I built this a while back, but only recently added the 'rope' which still needs to be tied off some-how. The kit is from Battle-flag (link) and is BW4 Hang 'Em High Gallows. 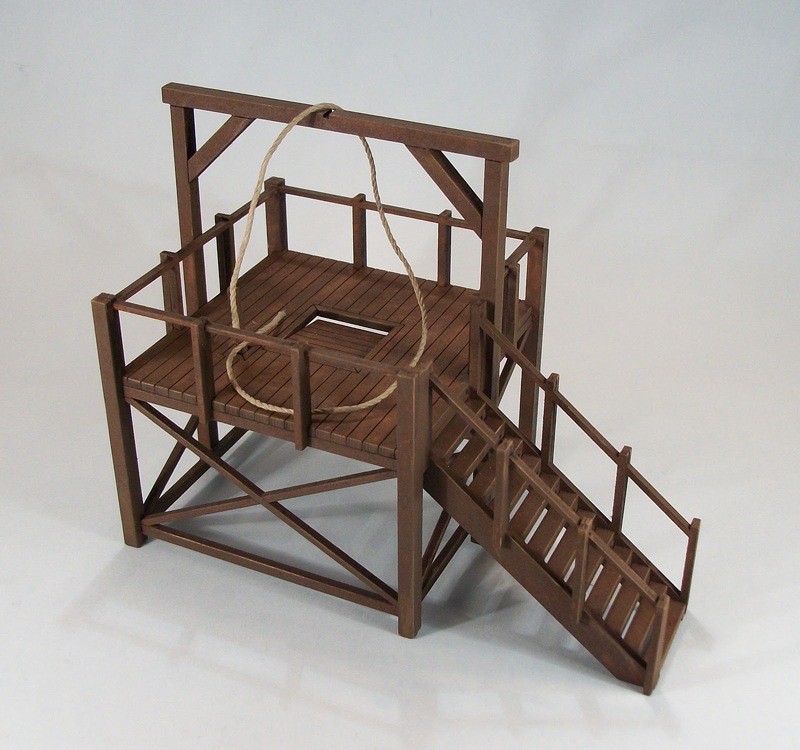 The rope supplied with the kit looked too thin for my liking, so I replaced it with a suitable alternative from Gale Force 9; that came in a black colour so had to be painted a suitable colour as an alternative. The kit comes with a base, which I was not satisfied about, so I assembled it without base (as carefully as possible, using dry fit to the base as a guide), and then snipped off the tabs to fit to the base. The painting was my quick washing technique from the other Old West buildings (using really thinned down Vallejo paints). 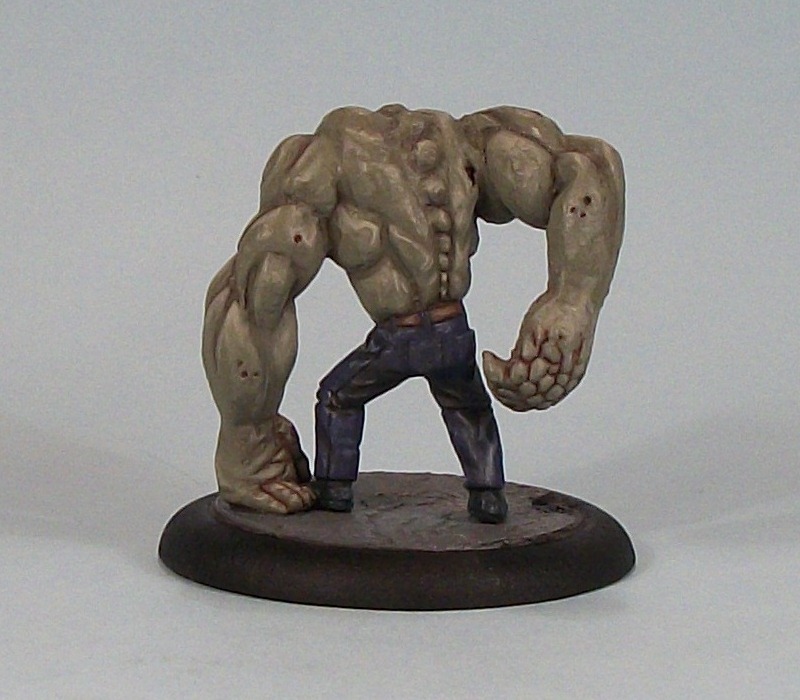 This is the second mini in the challenge, and Rob and I have agreed to get as many supers minis painted in one month a we can, after the relative success of Zomtober. So after last week's Harrier (seen on Pulp Citizen here) this week I have painted the Lady Tiger mini from Reaper's Chronoscope range. I make no bones that the colour scheme is stolen off a certain Marvel-lous cat-themed super; if it works why not? After last months Zeds got my painting rustiness out of the way, it has been nice getting more diverse pieces painted, and diversity is definitely a key point with this month's challenge. This mini may never even see gaming - who knows - but it was nice to paint and nice to have it finished. Lady Panther's back-story has her as an Unhuman adventurer-thief with cat-like powers,who keeps making bad decisions, such as throwing in with the Crimemasters from time to time! Keep watching here and Pulp Citizen to see how I get on! Oh Knight Models, take my money now. Really, I will check down the sofa straightaway. 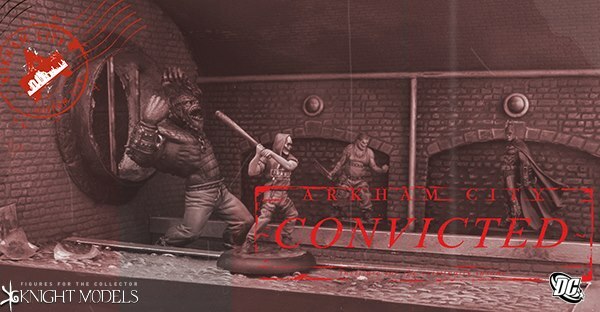 The words Batman Miniatures Game (or will it be Arkham City?) and expectations of Knight Models based on the quality of their other sculpts means I am sold sight-unseen on this new game and its minis. After seeing some of the previews I am definitely in. This ticks so many boxes for me. Great IP, great (presumed) quality, and the option to use terrain I have already. I have serious doubts about the game simply based on the fact that this is Knight Models first foray into gaming, and I thought I heard a rumour at salute about a Star Wars game from them; so is this a re-purposed system? Who knows. 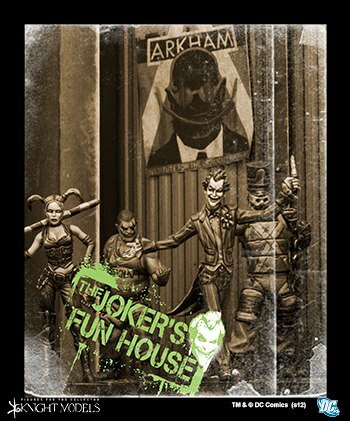 Well the Star Wars license has gone and this could be brilliant Or it could be some decent minis and a terrible game, I don't care - they got me at Batman Miniatures Game, even if the prices are sky-high. This won't replace Pulp City as my favourite, simply because I feel so invested and immersed in the game and its continuance, but as a side-line? Well that is another story. So excited am I about this, that I shelled out for the 35mm Batman mini KM do, not even knowing if it will scale with the upcoming releases! Oh Knight Models, get those minis and that game out now, please! 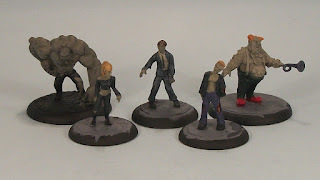 Okay, after the relative success of Zomtober, and with Rob mentioning he felt that he was behind in painting 'supers' minis, and with me knowing I have been remiss in painting through the year, we have settled on SupersNovember. Or Supervember, Or whatever we will call it (I favour Supervemeber right now, or maybe Newsupersvemeber, who knows...). Anyhoo, the plan is to paint one 'supers' themed mini per week through the month. 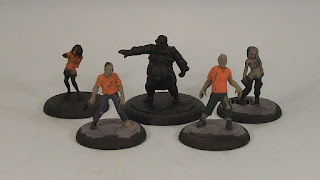 To that end I have picked out three Pulp City minis (one of which will be for Hendybadger's Paint the City Pink initiative), and one Chronoscope super. 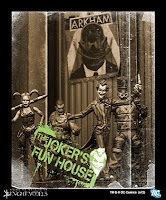 So most will be posted on the Pulp Citizen and one will be posted here, if I hit my targets. The minis I plan to do are in the picture, but plans often change don't they? So each week, ending the 7th, 14th, 21st and 28th we aim to each finish at least one 'supers' themed mini. 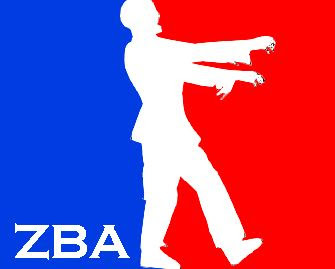 yes some have a little work on them done already, but we agreed that as part of the Zomtober ground rules so it apples here too. 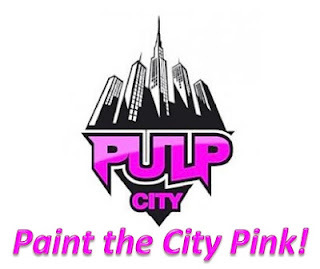 Wish me luck and stop by the Pulp Citizen and/or here for progress updates! Okay, being ever the sporadic painter and modeler I have been challenged by my main gaming buddy Rob to get some stuff done. 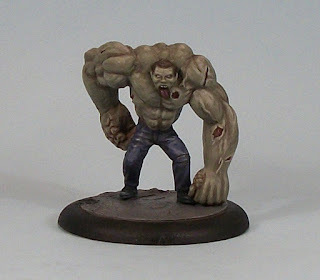 To that end Rob has thrown down the Zomtober gauntlet: to paint at least one Zombie mini per week during October, and one bonus mini for a minimum of five in total. We have set each Sunday as the deadline for one mini per week (7th, 14th, 21st and 28th) and anytime before the 31st as the deadline for the bonus mini. So the top picture has the minis I plan on finishing, and the bottom picture has those that I would love to finish in addition. We agreed that part-painted but unfinished minis could be allowed! We also plan to do something similar in other themes in occasional intervals. A second of these by 4Ground, to show the difference between the two painting styles I used. 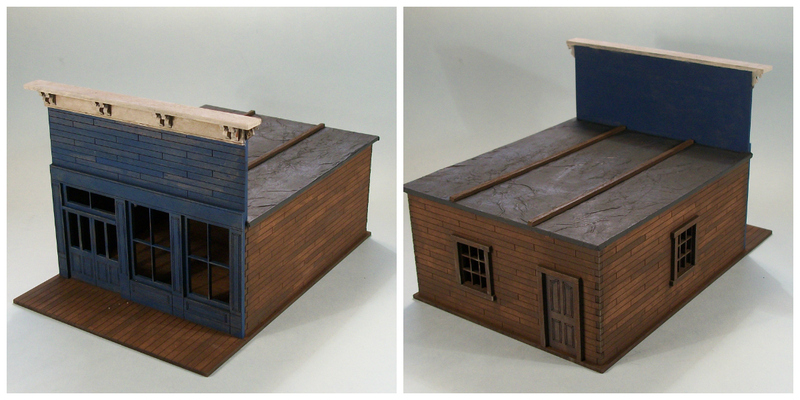 Okay, been a while since the last update, and this week has seen some frantic painting and modelling. Rob conceived a basic idea for Hallowe'en Madness II, and that immediately kicked me into gear building all sorts of Old West what-nots that I had acquired in recent weeks. 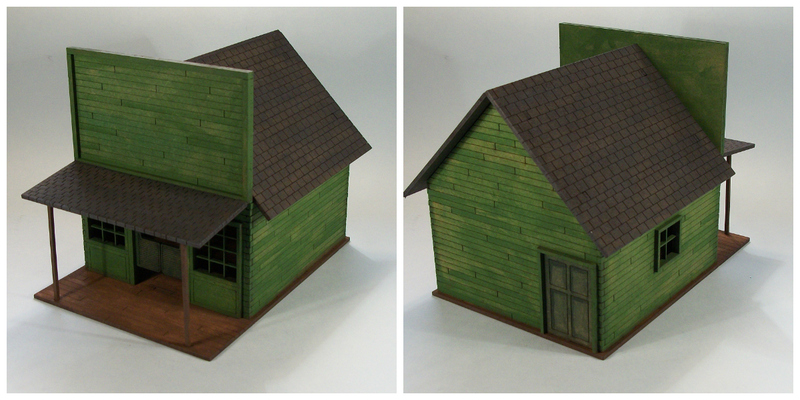 Of those, these buildings were quickly painted using thinned down paints straight onto the laser-cut MDF. I had planned to undercoat them and paint them up from there, but i then ran with an idea I saw on Lead Adventure Forum, and so settled for painting straight on. With the way the MDF soaks up the paint, it left me with a natural variation of colour that I felt was suitable for the types of building I am representing. I then picked out some individual planks to paint with a thicker paint to break up the uniformity further. 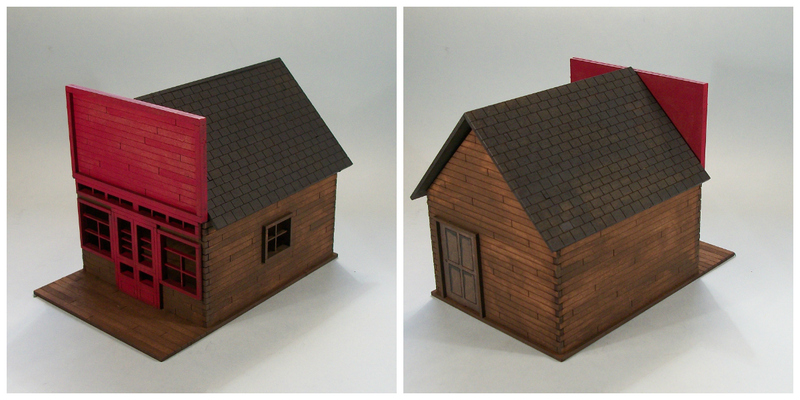 The buildings will eventually have some signage (measure are at hand in that regard!). The two apex roofs were part of the kits as bought, while the flat roof had some scrunched up paper stuck on with thinned-down PVA, and a coffee stirrer cut into two halves length-ways and trimmed to fit. While I was building these, I also tackled some wagons and a gallows, which are all near to finished and so should be posted soon. Or at least soon-ish. I have been planning a semi-permanent table since moving house last year, but inevitably plans fell by the wayside as other priorities cropped up. However, impetus was recently renewed when we (the wife and I) needed to order some building materials from Wickes, and she suggested that if I needed any stuff for my planned gaming table it would make sense to order it at the same time. I did not need to be asked twice. The problem was always going to be a combination of limited access size to the attic, and my limitations as a crafts-person. Seeing what the limits were I settled on assembling a 4' by 4' table top onto which I could lay battle-mats to represent grasslands; urban; sand/desert/dusty western town. I had a spare bedside cabinet from the move last year, and picked up 3 more to form the 'legs' for the table top (they were on offer, saving me money I had not expected to save - talk about serendipity!). So a few nights ago I spent 2-3 hours assembling the 3 new cabinets, then today a couple of hours assembling the table top. As you can see from the top picture the table is untextured; my plan is to simply lay on top what ever I need when ever I need it. the cabinets double up as terrain storage areas, complete with labels to make finding stuff easier. 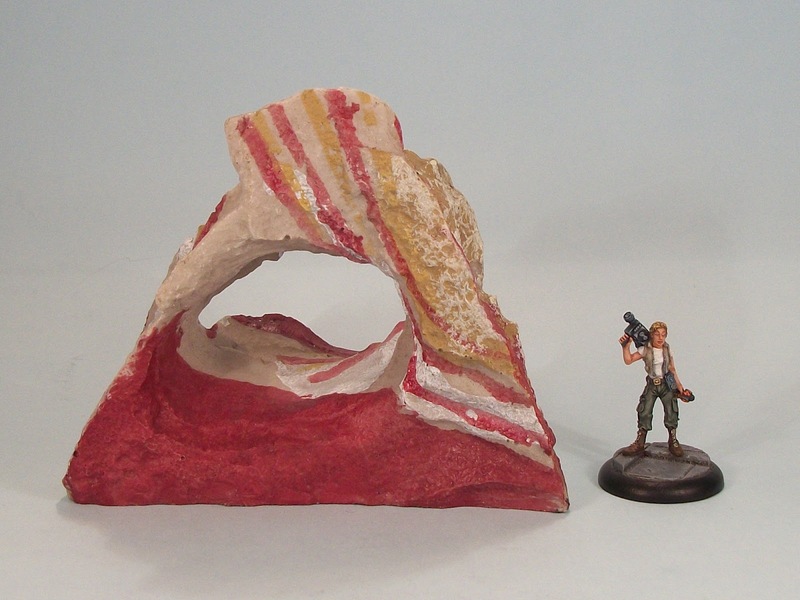 I have some terrain modules from Ziterdes that I plan on making into a nightmarish alien/other-dimensional landscape. Not the biggest table in the world, but sufficient for my needs, and it means I can look at some home Anima Tactics, 7TV and Warmachine/Hordes gaming among other things. I may even dig out some of my old WH40K armies too! So there should be now time and motivations to get some more minis painted. This is the 4Ground Outhouse/Store Shed I picked up and blogged about recently. Assembly took around 25 minutes (see post here) and painting was also quick and easy. As mentioned previously, the footprint is 4 inches by 2 3/4 inches and the building has a height of 2 inches sloping down to 1 1/2 inches. The building was painted with and Army Painter spray Leather Brown base coat. Some by-hand touch up followed (also Army Painter Leather Brown), and then some dry-brushing with Stone Grey (Vallejo) mixed with Leather Brown. I picked out some particular planks with Stone Grey to provide colour variation. I love these trees from Tablescape, I really do. They don't shed flock like the traditional wire and flock gaming trees, and can survive being knocked over etc. 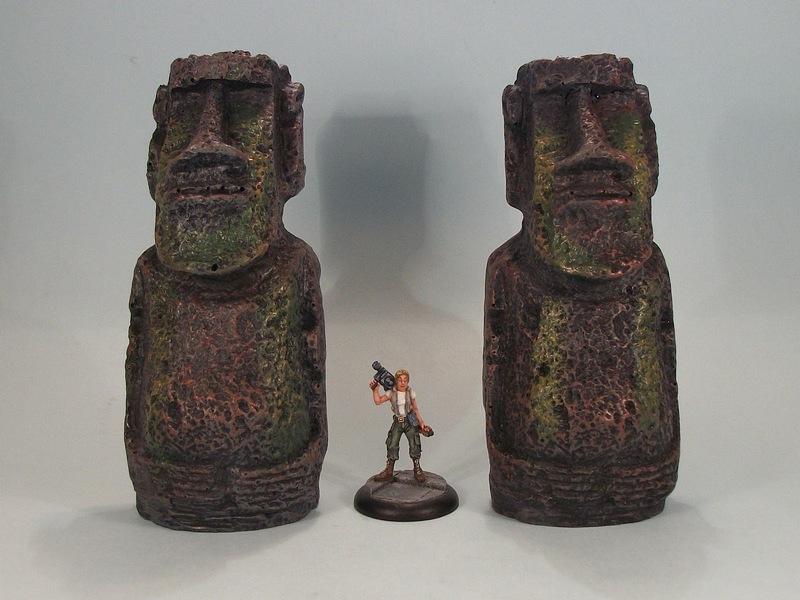 Added to that, they come pre-painted and I think they are simply marvellous. Of course tastes differ, but I wanted to draw attention to them for anyone who may be interested. 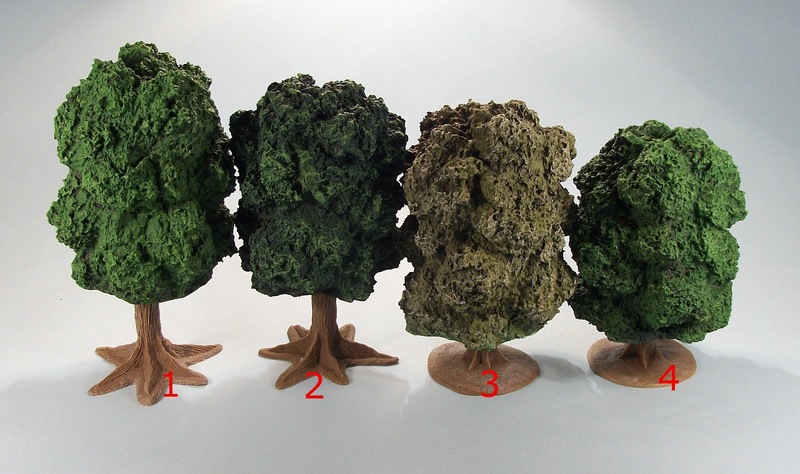 The trees are made of hard foam and are £3 per tree, or 5 for £14 at current prices. Tablescape offer two base sizes which can be seen in the picture. 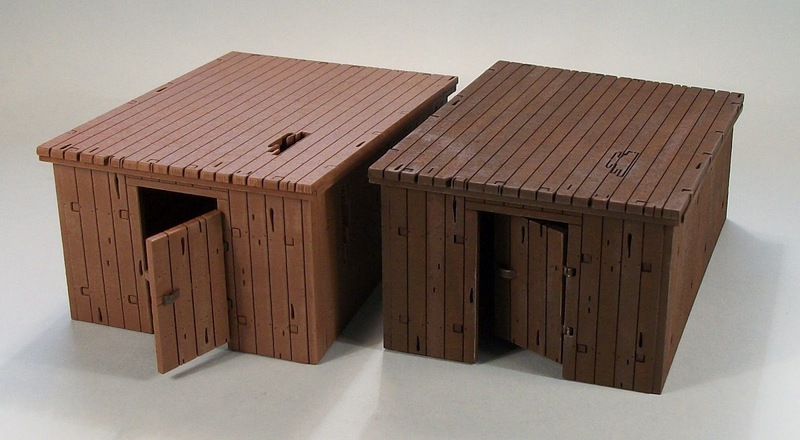 The bases come separately (but are included in the price) and simply screw into pre-made holes. The underside of the 'foliage' is in the hard foam colour; simply paint it with some acrylic - 5 trees can be done in a matter of minutes. 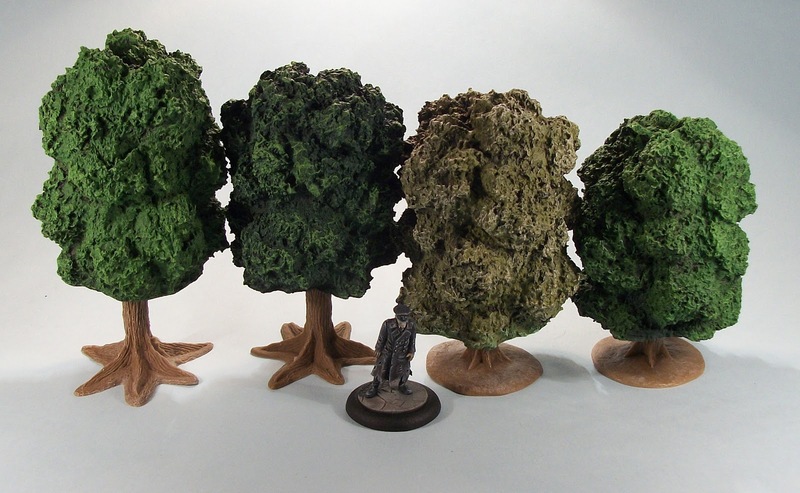 I use Vallejo Black Green for the two darker colours, and Vallejo Medium Olive for the more olive coloured trees. The two base sizes effectively give two primary variations of height among the trees. More variation can be added by cutting down the trees. The underside of the 'canopy'/'foliage' is flat, and what I did was take off 0.5 to 1 cm on a handful of trees. As can be seen this allows for an increased variation of heights very easily, especially if you don't want mix the different base styles. 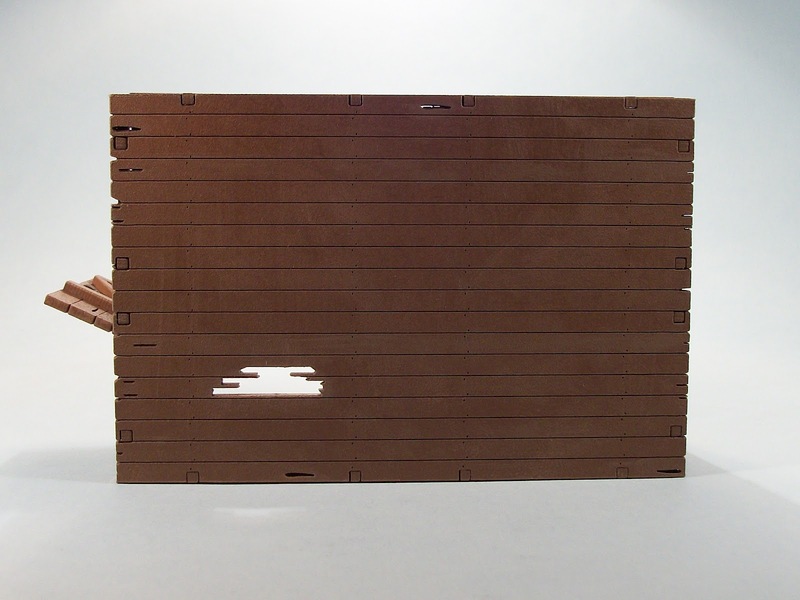 The cutting was done with a coping (or fret?) saw in some cases and a bread knife in others. The coping saw made for easier cutting. I then sealed the undersides with a thin coat of liquid green stuff before painting as above. 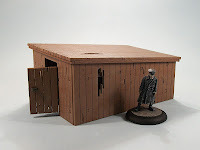 Okay, I am after a lot of the same colour water based acrylic in a dark grey (think German Grey or Black Grey by Vallejo as an example); I need to paint circa 24 square feet of terrain, and so mixing is simply not an option since I may need to colour match at a later date. I looked at docrafts Artiste paint which I like and is cheap, but they do not appear to do a dark enough grey (basically a not-far-from black kind of grey). 4. not exorbitant in terms of cost. 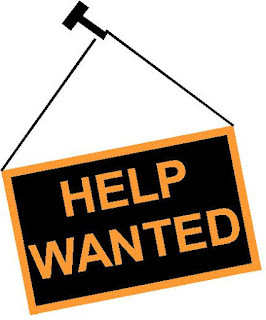 If anyone can point me in the right direction I would appreciate it (an hour of google fu failed me this afternoon); feel free to comment below. Thanks in advance. On other stuff, I hope to do a couple or so terrain posts soon, so watch this space. I enjoyed Salute 2012 immensely, attending with main gaming buddy Rob (his blog is here). As is usual for us we travelled down by train, and as usual I mused whether I had planned the journey well enough to avoid being at the end of the queue. While in the queue Rob found a winning 'golden ticket' for KR Multicases which he later handed in a for a marvellous bag. Very cool. Into the hall and my first stop was Pulp Monsters stand for my favourite game (Pulp City). On show there were some sneak peeks of new stuff (which I blogged about here). At the Pulp Monsters stand I finally got to meet with Hendybadger, (of the Tales of a Tabletop Skirmisher blog here), along with Mrs. Badger and the very mellow Baby Badger (replete in pirate outfit - Hendybadger is nothing if not consistent!). It was great meeting Hendybadger at last, and I reecieved two very kind gifts from the Badger's - a cake baked by Mrs Badger (thanks!) 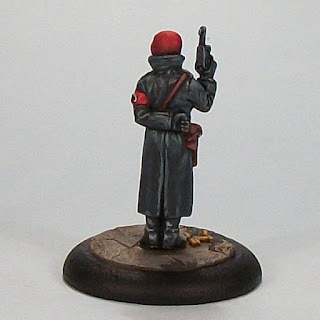 and a lovely mini which will be painted and shown on the Pulp Citizen blog very soon!). It was great to meet you guys. 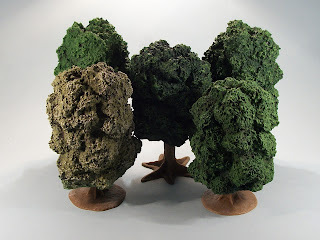 - Some tree bases from Tablescape (look for a hobby tip post soon on these and their trees). So it was mainly bits and bobs from various manufactuers. A number of boards caught my eye. My pick of the bunch was the Crooked Dice 7TV main display board. I wish my better pictures were the ones covering more of the board, but alas not. The board was brilliant and a great advert for 7TV and its ethos, reflecting its heritage from Bond movies and in this case of course from On Her Majesty's Secret Service. Two more boards especially caught my eye. There were so many good ones, but some stood out. 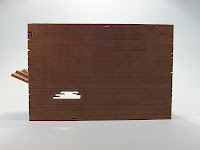 Micro Art Studios were previewing their upcoming (Autumn 2012) Wolsung laser-cut terrain across two wonderful boards. Wow. I cannot wait to get hold of some of this. This terrain is stuff that will be pressed into use for Pulp, Supers/Pulp City, Victoriana, and maybe Zombies gaming when i do get hld of some. It was simply stunning and looks to be truly modular with so much possibility for inter-connection and multi level gaming. As I say, I cannot wait to get hold of some of this stuff. Lastly, great mention has to go to the Scarlet Thunder board. I have no idea what was going on with the game, but the board was fantastic, so very worthy of mention. I just wish I have better pictures of all the boards I enjoyed but this is a rough guide to what I got to see, and what I enjoyed. 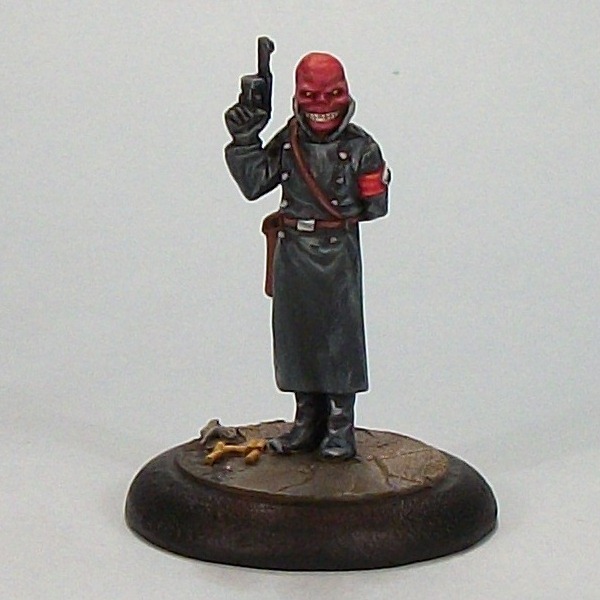 Okay not in any way a Red Skull mini, just one that conveniently was close enough to paint up as Herr Johann Schmidt. Whew - safely navigated that minefield. This not-in-any-way-at-all-like the Red Skull is a mini from What The? Now I believe their lines have been taken over by another manufacturer, so may still be available. This one got started as an afterthought when painting another mini, Sgt. Bale Extreme (on Pulp Citizen), mainly to pass time while paint dried on Bale. 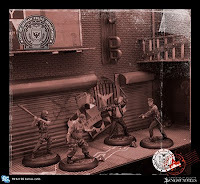 I decided this week to at least clear a couple of minis so this and the previous Boss Zombie fitted the bill and voila - one super-baddie that can be used for supers, Weird War II and probably other stuff as well (pulp maybe?). Labels: Fenris Games (bases), Supers, Weird War II, What The?